Don't forget to check the devotionals at Good Morning Girls Wednesday and Friday. Both Solomon and his bride express their love for one another. Have you taken time to be completely honest with God regarding your true admiration for Him? God desires a relationship with us and proclaims His love for us throughout His word! As you read God's word and discover the depth of His love for you, how does it change your relationship with Him? Our love for God should cause us to desire to always seek Him and not let go. How do you ensure that you're diligently seeking God? 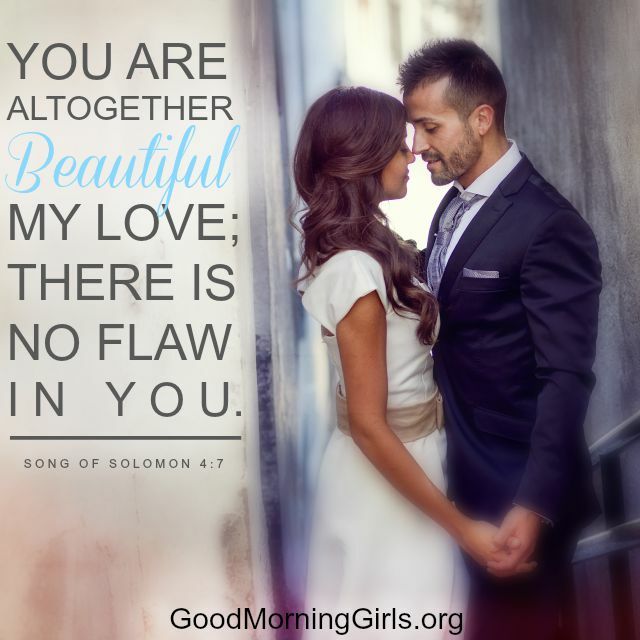 Solomon expresses how much he admires his wife's beauty. How has God shown you how special you are to Him? Beloved - dear to the heart; Friend - one who is attached to another by affection. Does your relationship with God resemble that of a beloved friend? When I read chapter one what stood out to me was that she was intoxicated by the love of her husband. It made me think about how I should be intoxicated by my love for God. And, this will occur as I spend time at His feet reflecting on and admiring His goodness and His character through the reading of the Word and through prayer. 3 As an apple tree among the trees of the forest, so is my beloved among the young men. With great delight I sat in his shadow, and his fruit was sweet to my taste. She admires her husband and is delighted and refreshed by him. It is so easy to get busy, but I need to remember t take time and allow myself to delight in my husband and to be refreshed by each other. Also, it reminds me about sitting in God’s presence, like the cool of a shade tree on a hot day and be refreshed by His word and enjoy the sweetness of His relationship, love and grace. The banner was what went over an army to identify it. Our identity is God. He has claimed us as His and has placed His banner over us as He leads us to the banqueting house He has set for us in eternity. He has claimed us as His and labeled us and His own. She sought out her husband. I need to still seek out my husband, to make an effort like when we courted. Also, I need to seek God like this. Some people will do anything for someone they have fallen in love with. We need to be willing to do anything for God because we are in love with Him. I need to be willing to look high and low to spare no effort to draw close to God. She is identifying and calling out the beautiful things she appreciates. We should think about, remember, and comment on the things we appreciate about our spouses. It is so easy to always focus on the areas of dissatisfaction. It is important to focus on and think about the many things we love and appreciate. This is the same for God. We should think on, remember, and speak of God’s goodness, faithfulness, and majesty. We see many times how the Israelites were told to set up memorials so that they would remember what God had done for them. 4:7 You are altogether beautiful, my love; there is no flaw in you. We should choose to see the best in our mates. I don't mean to not honestly address problems. I mean an overall attitude where we choose to see the best in our mates. 1 I came to my garden, my sister, my bride, I gathered my myrrh with my spice, I ate my honeycomb with my honey, I drank my wine with my milk. Eat, friends, drink, and be drunk with love! 4 My beloved put his hand to the latch, and my heart was thrilled within me. We should not think of other men more highly than we think of our husband. Don't forget to check the devotionals at Good Morning Girls Wednesday. It’s our final week of our summer Bible Study. After Wednesday, we are on break until Monday, September 7th when we will start the book of Acts. The Shulamite says, "I am my beloved's and my beloved is mine." She is enraptured with love for him. Have you considered the depth of verse 3 and what it means to you? Have you ever been enraptured with love for Jesus? In verse 11, the Shulamite calls her Beloved to get up early and go with her to the fields, villages, and vineyards. When is the last time you looked forward with eagerness to rise early and meet with Jesus? 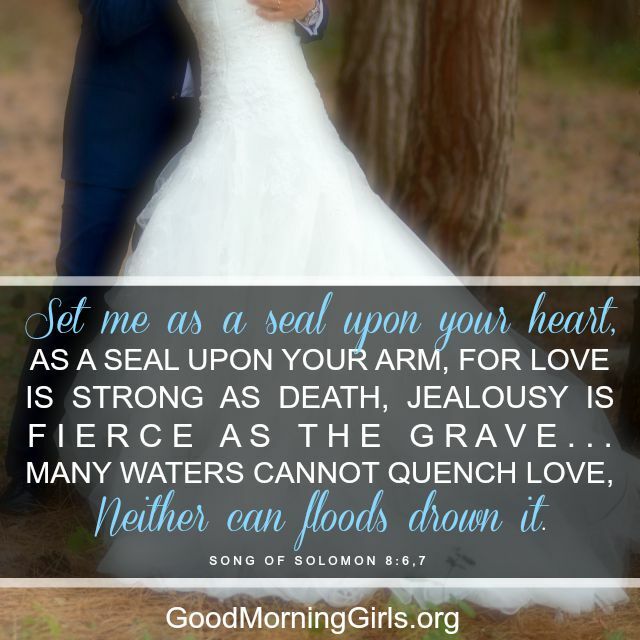 In verse 6, the Shulamite says to the Beloved to set her as a seal on his heart and his arm. She wants to be completely committed to him, and for him to have complete ownership of her. In what way do you show your complete commitment to God and His complete ownership of you? It seems God wants romantic love to be pleasurable and to create these sensations in us. However, this type of love is only supposed to be a faint shadow to illustrate the union of Christ and the Church. Knowing this, I wonder what it will really be like when we have that perfect union with Christ in eternity.